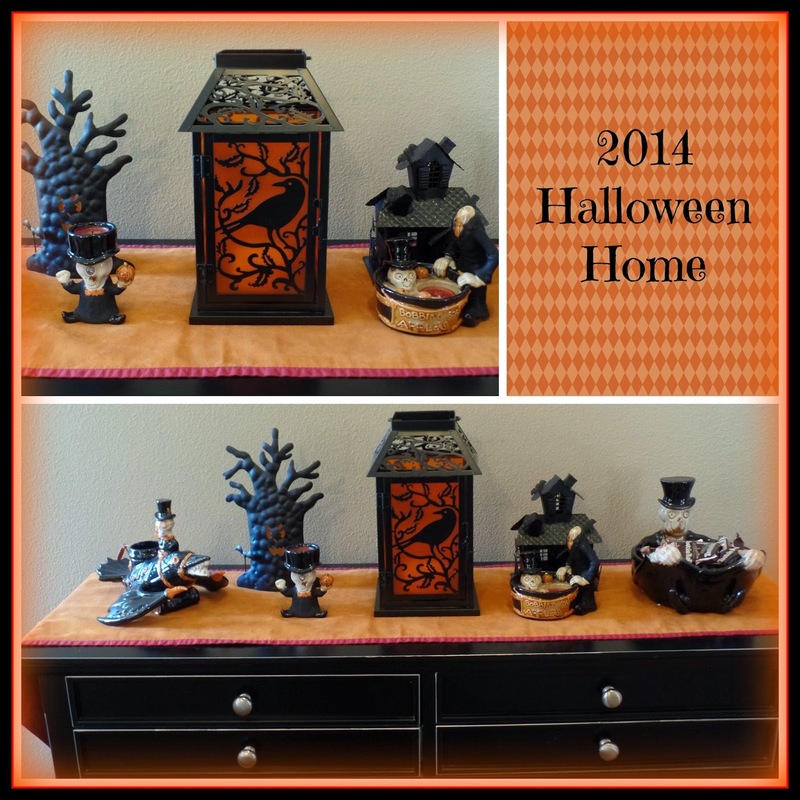 This is the decor in my little foyer, I love the new crow silhouette lantern I found at Target, it matches some of the metal pieces I have from previous years like my spooky tree candle holder. 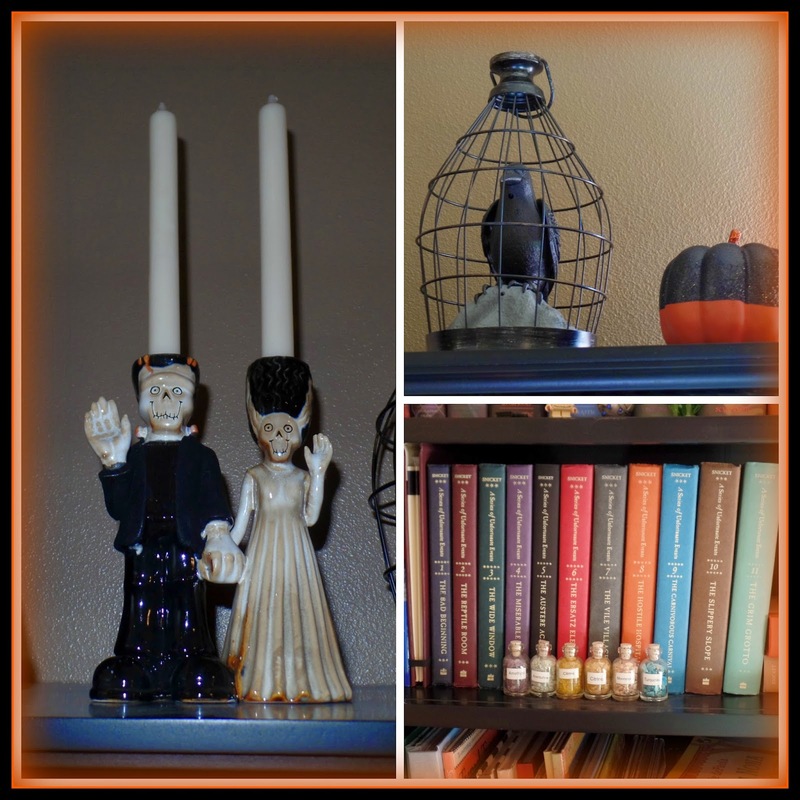 The orange and black metal pieces coordinate nicely with my growing Yankee Candle Boney Bunch collection. 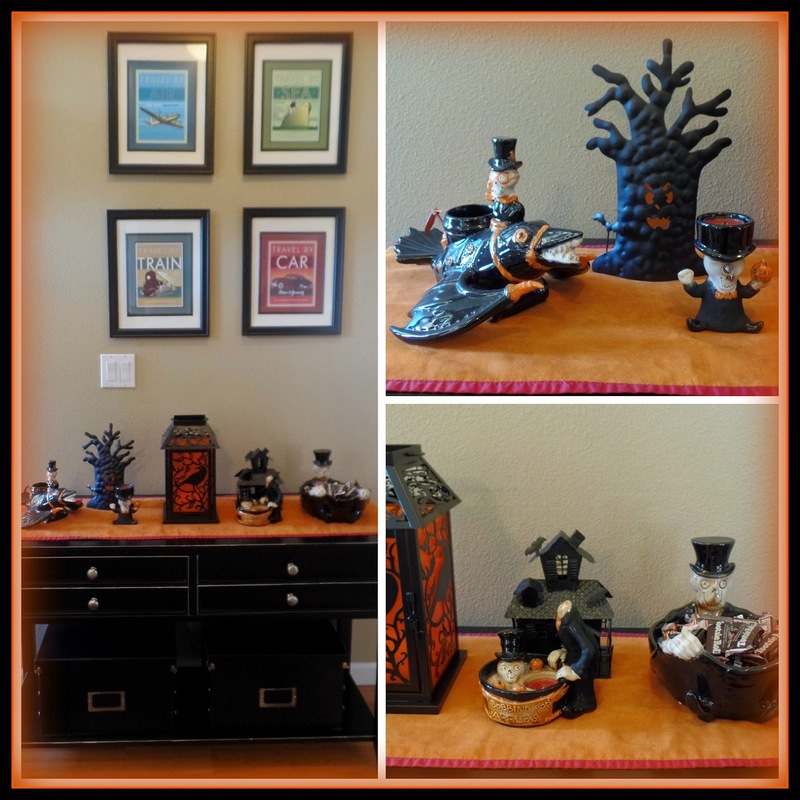 I have been collecting the Yankee Candle Boney Bunch Halloween Candle holders now for four years, this year they came out with a bunch of new cute items, like the bird plane votive holder that lights up and looks like it was inspired by Victorian Steam Punk. 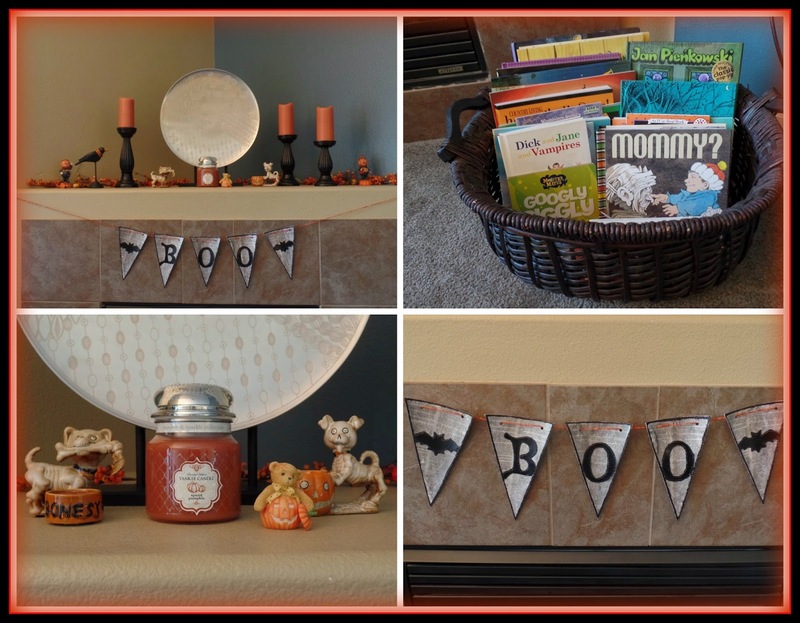 On my craft cupboard in the dining room I have a couple of haunted houses, the new one in the center under the dome, also from Target, lights up and little plastic pieces fly around inside to look like bats, all while playing a spooky tune. Me and the kids all thought our spooky phone (Target) was another fun addition. 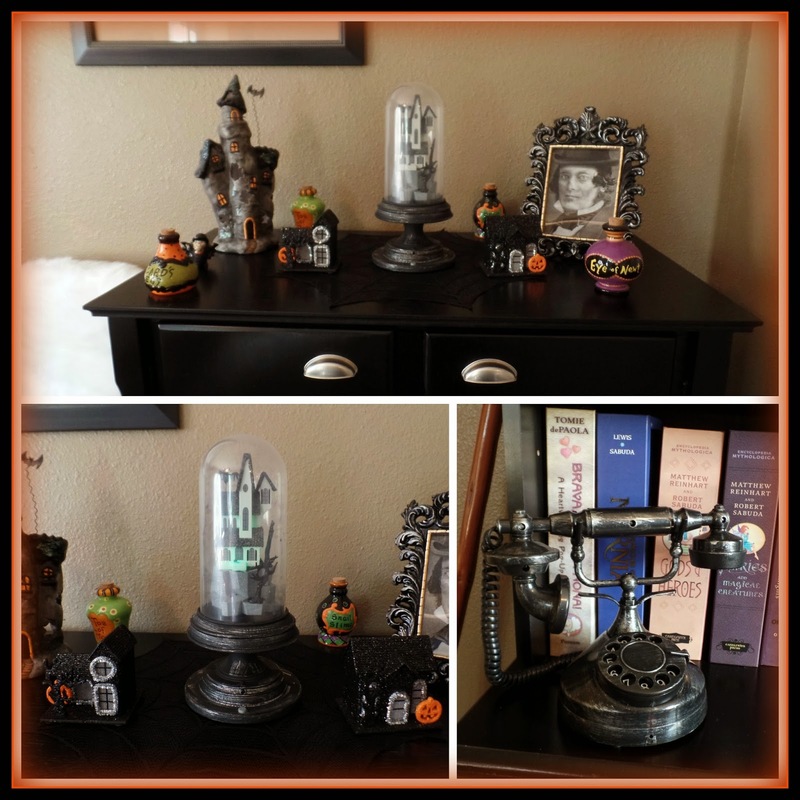 Our actual home telephone is a vintage black reproduction of a turn dial phone, so this Halloween phone fits right in. When you dial, it has an old fashioned ring, and when you answer a very spooky man's voice gives one of a five or six spooky messages. 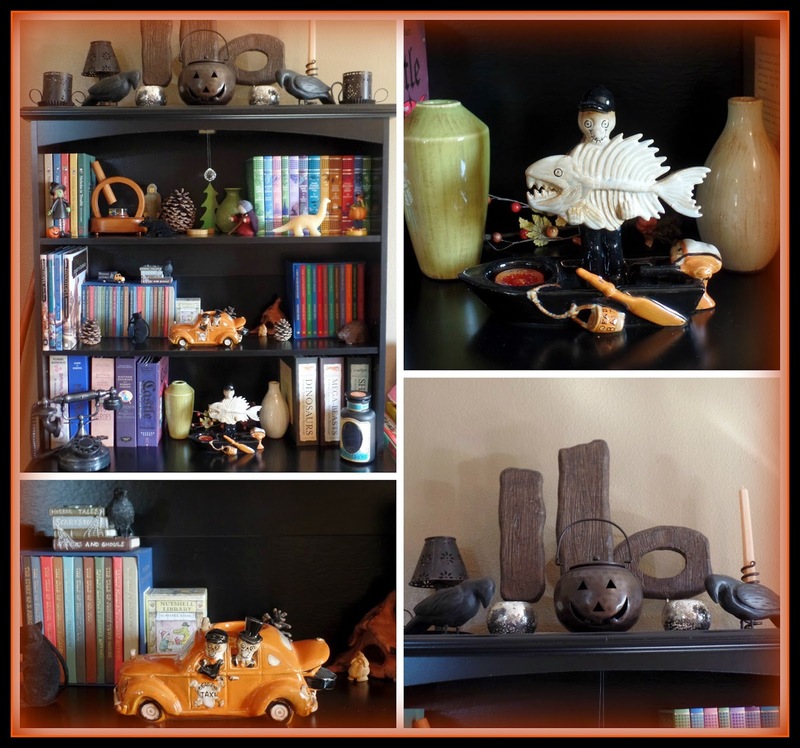 These metal bell crow topped trees are some of my oldest decor that I have enjoyed for years, the cat and pumpkin figures have a vintage folk art look and are also some of my favorite older decor. 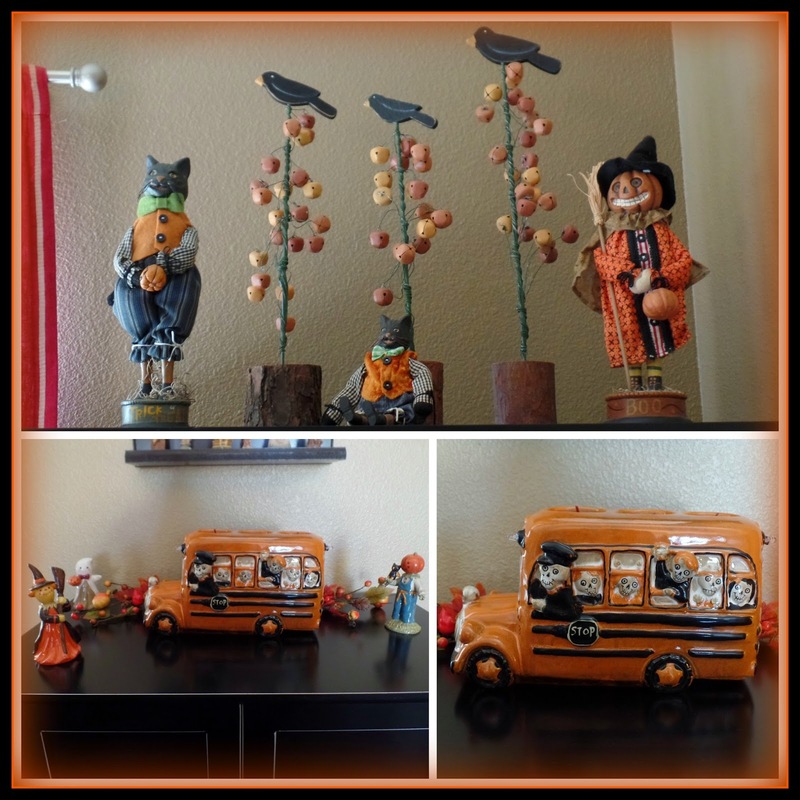 The School Bus is another 2014 Yankee Candle Boney Bunch piece, the bus lights light up, and it holds three little tea lights, the school bus looks cute with my little Halloween costumed figures that look like they are waiting for the bus on a fall school day. Throughout the house I have various candy dishes. 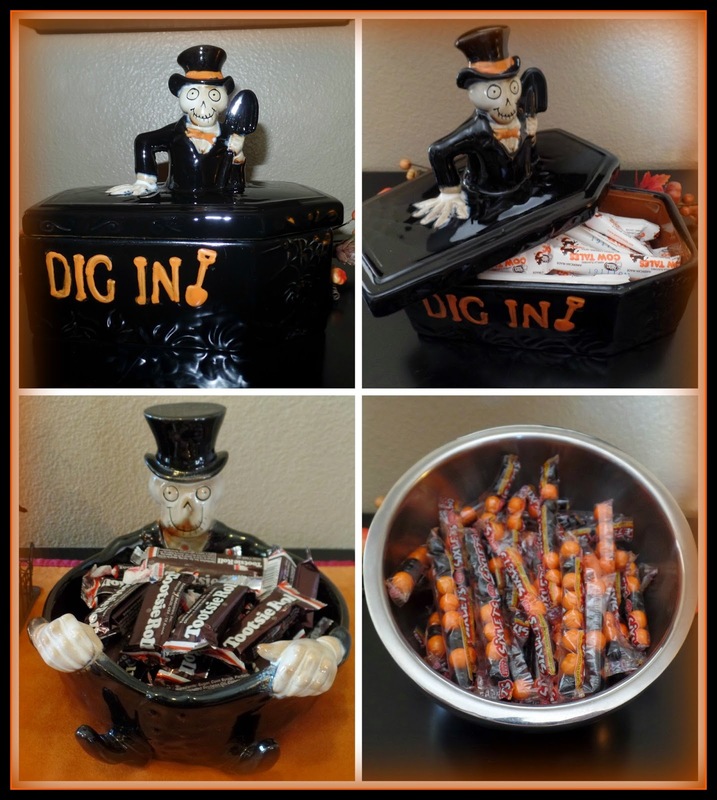 We have Cow Tales in the new Boney Bunch Coffin candy dish, a Tootsie Roll assortment in my old Boney Bunch candy dish, my childhood favorite Sixlets in Halloween colors in my everyday candy dish, and of course candy corn in another of my Halloween Candy dishes. Between the multiple Trick-or-Treaters and all my candy dishes we go through quite a good supply of candy in October! I absolutely love the Peanuts, and love It's The Great Pumpkin Charlie Brown. 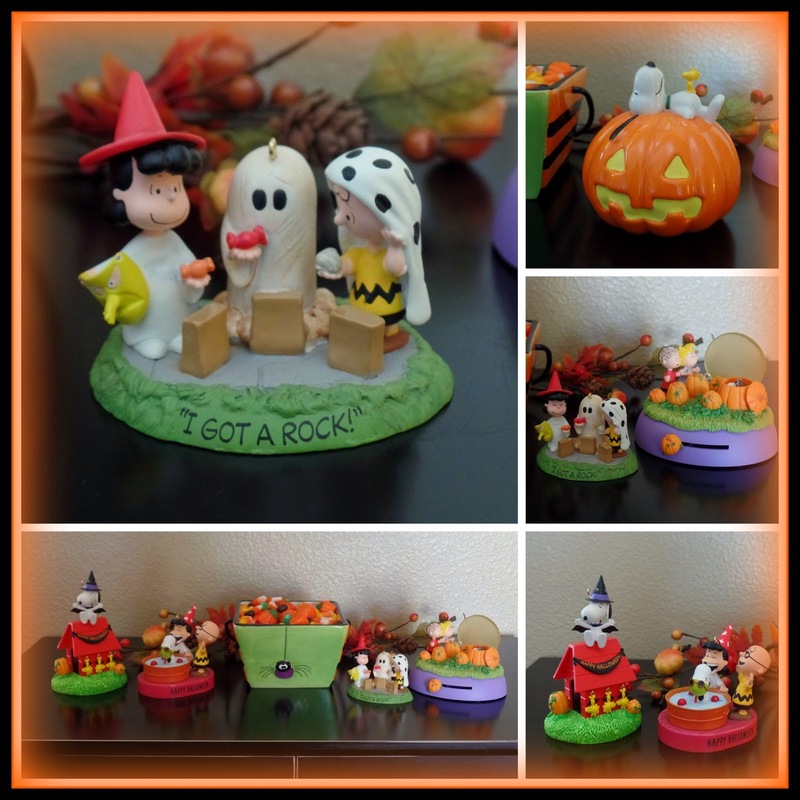 I have been collecting some of the Hallmark Peanuts Halloween ornaments over the years and think they are so cute. The newest one is Snoopy on top of his dog house with little hanging Woodstock vampire bats, Here is the Hallmark link so you can hear it's sound, which is really quite good for a little ornament, every time snoopy chuckles I can't help but chuckle myself, so cute! 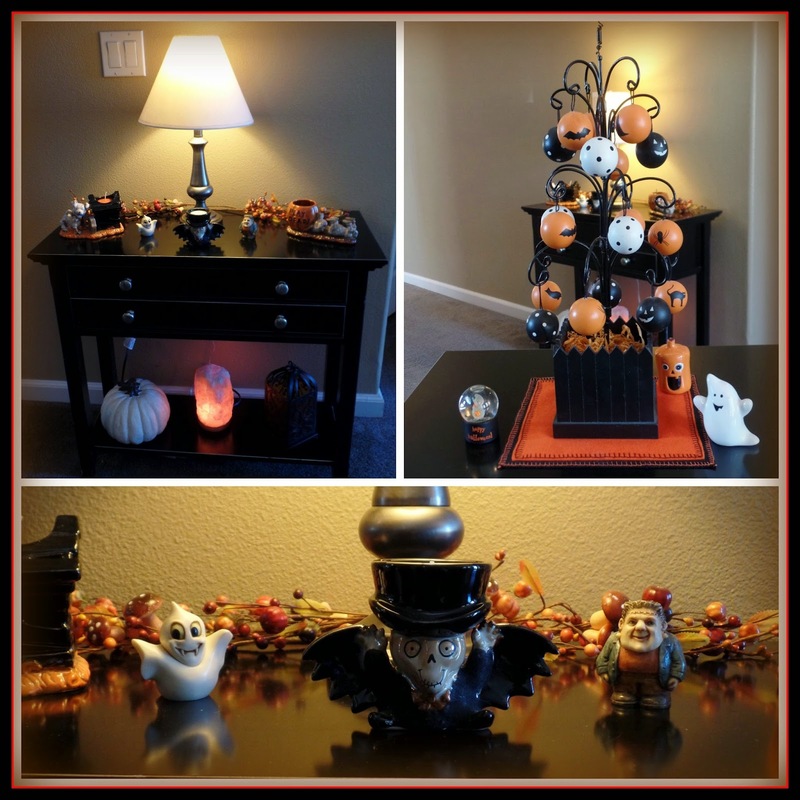 In my living room I have decorated all the little end and side tables, I love my little Halloween metal tree with painted wooden balls I got a few years back, and have lots of little trinkets that I have collected over the years. 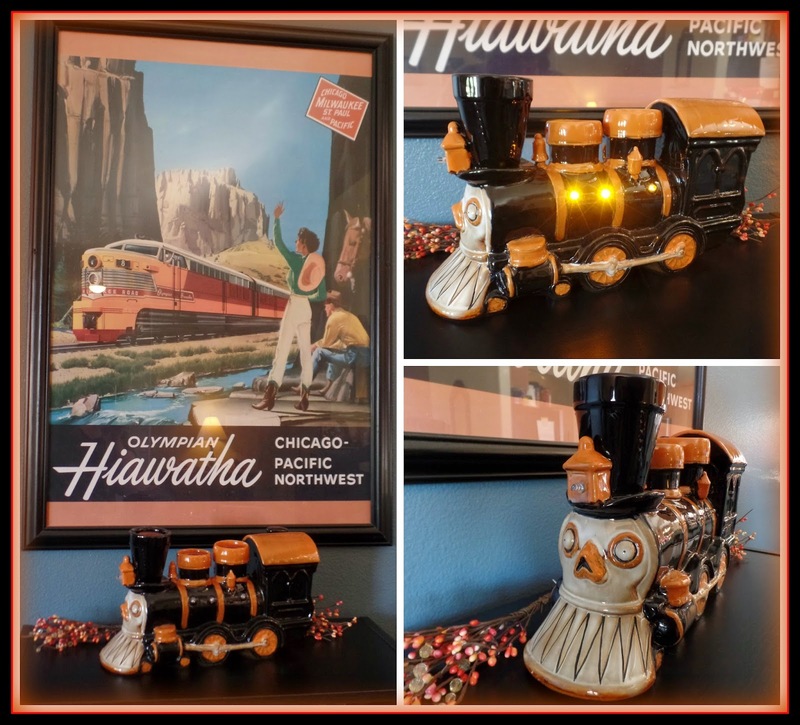 Last year Yankee Candle put out this Boney Bunch Train that is perfect displayed under my Hiawatha Train print, it lights up and holds tea lights, it is one of my favorite decorations. I think the best way to build holiday decor for any holiday is to collect favorite new pieces every year, store them carefully in organized totes during the off season, and over the years your collection will grow. 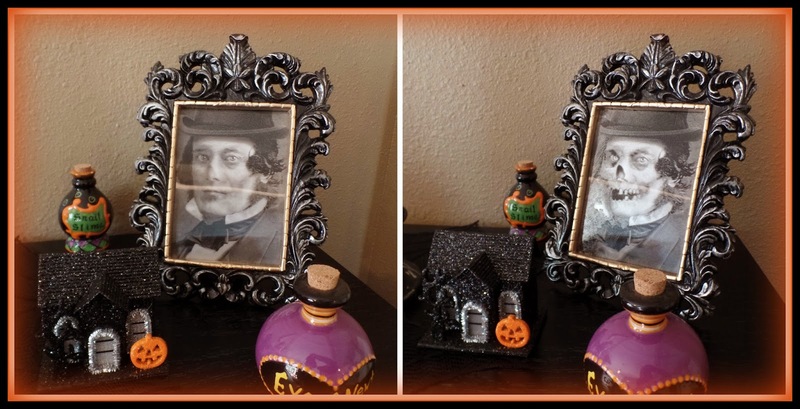 I have been decorating our home for Halloween now for twenty years, and I really love all the Halloween treasures I have found over the years. 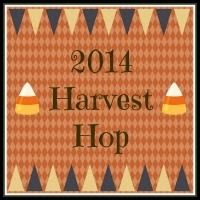 You may also be interested in my 2014 Harvest Hop Linky Party, click on over and link up your Harvest and Halloween themed posts and check out all of the great Fall ideas! Halloween is so fun! Very cute! I love your vintage travel poster.